State Superintendent Mark Johnson is again urging educators to choose a non-school day to protest in Raleigh. In an email message to state educators Friday, Johnson said a march could be organized “one day in June” after the traditional school year has ended. Johnson also suggested educators use their upcoming spring breaks to meet with him and lawmakers in lieu of the protest march and rally planned for May 1. “I plan to be in Raleigh for most of the days during the upcoming spring breaks in order to meet with you and legislators,” Johnson said. 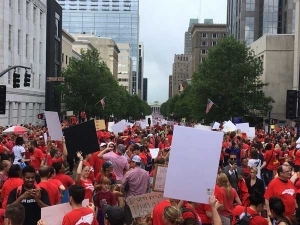 Last year, more than 19,000 educators and supporters came to Raleigh to march for better pay and increased school funding. Johnson said North Carolina’s school children have missed a lot of days of school already due to Hurricane Florence and other weather-related events. Johnson’s message was immediately criticized by some educators Friday on the North Carolina Teachers United Facebook Page. As of Friday, two school districts – Chapel Hill-Carrboro City Schools and the Lexington City Schools – have decided to close May 1 so teachers can attend the rally. “The legislature will be in session in Raleigh for at least another three months, a time period that spans dozens of days students are not scheduled to be in school, including spring break and summer break,” Johnson said. Responding to those remarks, Mark Jewell, president of the N. C. Association of Educators (NCAE), said the sooner educators make their demands known, the better. Restoration of retiree health benefits for teachers hired after 2021. .